Kids can make their own bracelet creation and explore the science of light activated pigments with accessories that can change colour in sunlight, or glow-in-the-dark. With this Build A Bracelet Studio, children can make up to 6 unique custom bracelets in different effects and design. They can make moving, swirling effects or wriggling and jiggling rainbow colors, glow in the dark and more. Children can make up to 6 unique custom bracelets using transparent tubing, glitter and coloured sand. 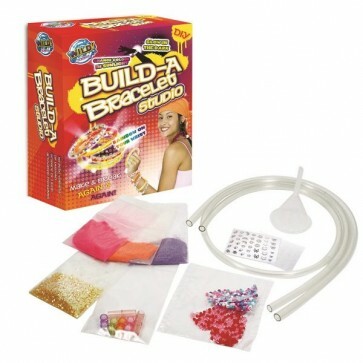 Simply fill the tubing with liquid water then customize by adding glitter, sand and beads. Create moving, swirling, flowing effects, or jiggling wriggling rainbow colours. Add glow in the dark stickers and magic sunlight colour change sticker add to the fun. Then you can break them and make them again.. and again.